Deep Cover, it’s a well-worn device that has thrilled movie audiences for decades. The story of a good guy officer implanted amongst the vipers the forces of justice are meant to bring down. The many perils of someone in that situation are ripe pickings for cinematic thrills; will that person’s true identity be discovered and what might the payback be? How will the operative extract themselves from their quarry without retaliation to friends and family? There’s always the possibility of the turn; whether due to the relationships forged while undercover - bonds made while becoming one with the bad guys and isolation from the good guys - or simple financial gain, that the upstanding lawman may simply go over to the dark side. All scenarios played in countless cop films and the question when watching one is, how is this different? 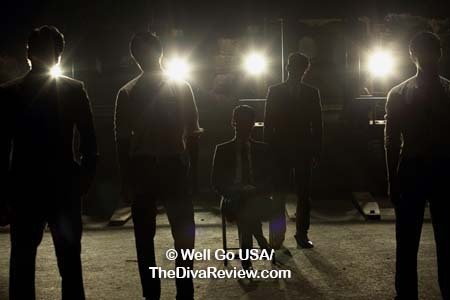 New World doesn’t try to reinvent the wheel with this premise; in fact it owes plenty to another Asian film that used the undercover idea so magnificently it was remade by Martin Scorsese. 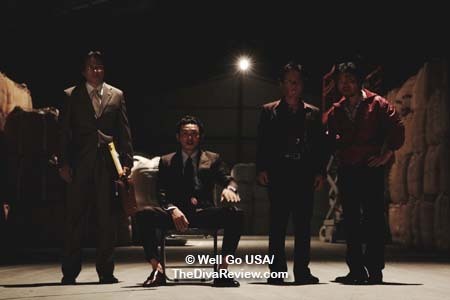 New World shares a lot of its mojo with Andrew Lau’s stark, brilliant Infernal Affairs, but what it does to stand apart is go in even harder and less subtly than the Hong Kong classic, twisting the relationships of the heroes and villains into a web where our protagonist cannot see which end is up. There’s also a healthy helping of Johnnie To’s seminal treatise on gangster politics, Election, making for a bewitching stew of cinematic corruption. As one sun sets, another rises; so it is with the gangsters of Seoul. The previous head of the Goldmoon syndicate met an unfortunate end in a wreck of metal, so now the gathered bosses must meet to mourn and consider who will take over the family. The titular second-in-command is seen as more of a straw man or front and isn’t expected to actually lead. Also in contention is the tough, short-tempered Joong-goo, who generates more fear than respect from his peers. Lastly, we have Jung Chung, an oddball of Chinese lineage who has managed to create huge financial gains for all the families under the Goldmoon umbrella with his overseas contacts. His tacky, easygoing manner makes him hard to take seriously, but no one can argue with his achievements. 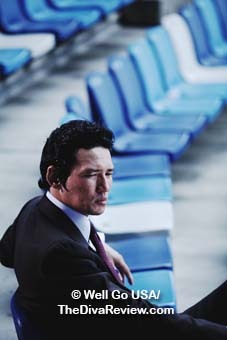 At Jung’s right hand is his closest friend, Ja-sung: Efficient and unassuming, Ja-sung serves as Jung’s eyes in Seoul when he is away on his many out of town jaunts. Their relationship is so tight that there’s no way Jung could ever suspect that Ja-sung is actually a police officer embedded with his crew for years. 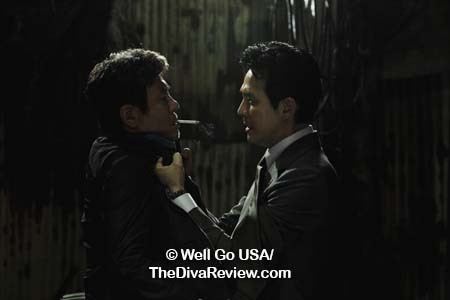 Ja-sung faces the constant risk of being discovered as a double agent and it’s finally begun to play on him. 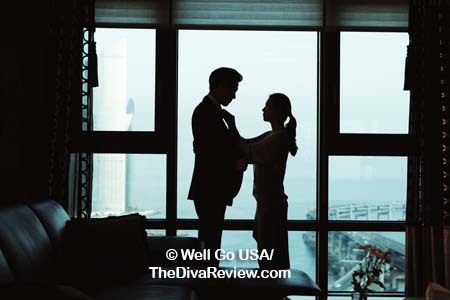 The question of whether he or his wife will stay alive long enough to meet their forthcoming baby is further impetus to get the heck out of Dodge. Unfortunately, with the upcoming change in Goldmoon’s leadership, Ja-sung’s real boss, Chief Kang, feels his man on the inside is needed more than ever to help sway the election in a way he believes will finally enable the police to break the mob. What Ja-sung doesn’t know is that Kang is playing both sides up the middle and everyone all around; not only deploying Ja-sung undercover, but negotiating with the thugs themselves to cooperate. That mixture of inside and exterior enmity is sure to cause an explosion between the rival factions and Kang doesn’t seem to care who gets caught in the blast. Kang has been chasing these gangs for so long he can’t see the human cost of his plans, only the result he’s worked so hard for, and as casualties rise on all sides, Ja-sung knows he must make a decision, which could endanger him no matter where he turns. 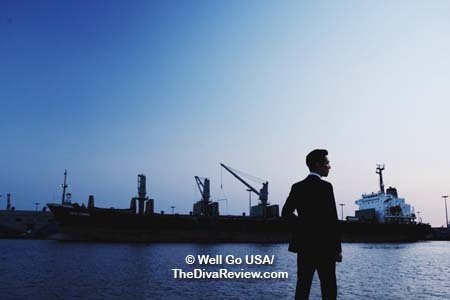 Tense, dark and violent; as I mentioned, there’s not a ton of subtlety to New World, which is evident from the first scene where a suspected traitor is cruelly tortured before sitting in a steel drum for a cement and sea water facial, but it is intelligent and perfectly acted. 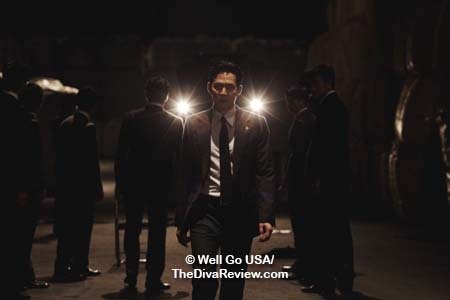 Watching as Ja-sung, played by Lee Jung-jae, must continue his disguise as the cool, ruthless gangster while his nerves are shattering below the surface is edge of the seat stuff. He’s written fully enough that we understand his desire to do the right thing - the whole reason he joined the police force in the first place – but we can also identify with his alienation and fury as Kang’s Machiavellian plots render himself and others caught in the game dispensable. With the coming of his first child, Ja-sung wants to live more than ever, and he realises in Kang’s grand scheme, his existence is not a priority. It’s a cold comparison to the family of murderers he’s been nestled into for nearly a decade, where loyalty is a given and avenging a fallen comrade is a point of honour. 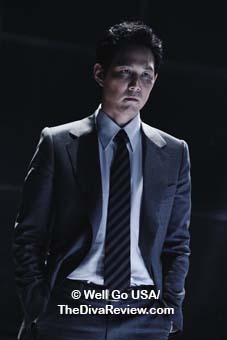 Lee Jung-jae has the ability to let the viewer know what’s going on behind Ja-sung’s eyes in his moments of agonising fear and doubt and can just as easily shut us out as he does when back in undercover mode. The excellent Choi Min-sik plays Chief Kang, the head of the undercover operation who really should’ve packed it in before the lines blurred. Choi imbues Kang with the archness of someone who’s seen way too much damage and has nothing left to lose, and therefore expects the same lack of self and soul from his team. He’s tough enough to stand up to the gangsters in a one-on-one battle of egos, but also recognises how outgunned and overmatched against the syndicate he is as just another cog in the police department. In a small but standout role, Song Ji-hyo plays Ja-sung’s handler/confessor; a tough as nails female officer kept as much in the dark about all of Kang’s angles. Stone cold and steely, she is only out of her depth when suddenly having to deal with the emotions that rage out of Ja-sung as he grows more fearful and frustrated. 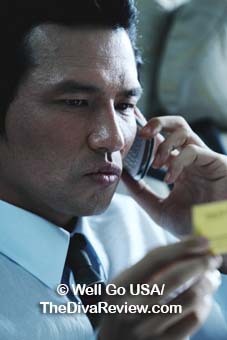 Hwang Jung-min plays it goofy as the gaudy gangster, Jung Chung, a man whose relentless pursuit of women and fake designer goods seems almost as important to him as his place at the head of the mob family table He’s a psychopath, no doubt about it; that vulgar, doofus veneer hides a sadistic shark with a chip on his shoulder. Like many madmen, Jung also holds his few personal attachments in a viselike grip, which explains a lot of his brotherly love for Ja-sung, even when the hacking of Seoul PD servers turns up some potentially troubling information. Jung’s lightning fast shifts from simple moron to cunning sociopath are enthralling to watch. Gripping stuff, all of it. 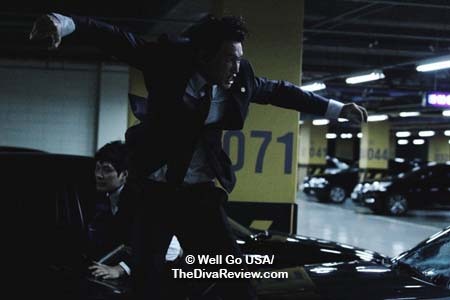 New World retains all the best qualities of those aforementioned HK movies that surely lent their DNA to this project, while pushing the envelope toward darker, more brutal edges. 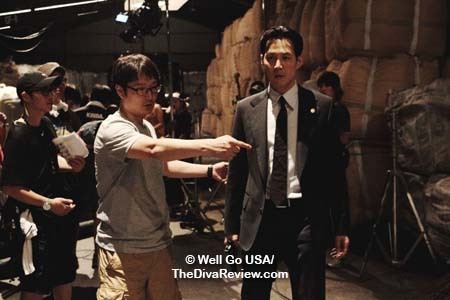 It wasn’t much of a surprise to discover that director, Park Hoon-jung is also the man who wrote the excellent, epically disturbing thriller, I Saw the Devil. 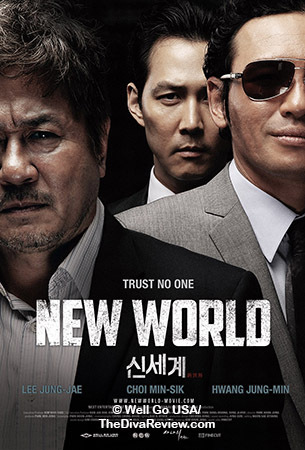 If New World is any indication of what’s in store for the future of the Asian cop drama; harder, sharper, yet finessed and even elegant, then carry on Korea. 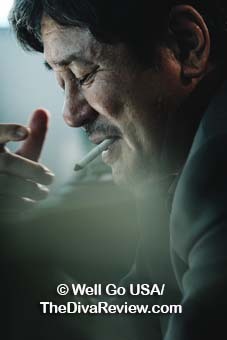 Click here for our Exclusive Interview with New World star Choi Min-sik at the 2012 New York Asian Film Festival.